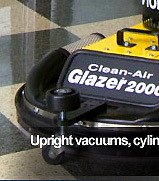 Powered by compressed air, the patented Venturi powerhead generates 242" (615 cm) of simultaneous wet/dry pick-up power. Their are no moving parts, no sparks and absolutely no motor maintenance. 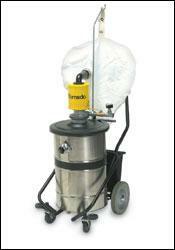 This Tornado Taskforce is ideal for heavy-duty applications requiring aggressive suction power. Perfect for high volume recovery of wet material, and with it s thoughtful external filter, can recover dry material as well, without stopping for a filter change. The unit comes complete with a large 1,268 sq in (8,179 sq cm) external poly filter, 18-gallon (68-liter) stainless steel tank, and a Tip & Pour Carrier for easy liquid/debris disposal. The unit is shipped standard with a 3/16" air jet installed but we also provide a 7/32" and 1/4" fitting for recovery of heavier materials. Add the 90660 hose and tool attachment set to complete the set up and watch your maintenance headaches go away.